I recently joined Suzi Blu’s Gypsy Art School and signed up for her online class, Tell Your Story, an art journal workshop that documents the story of our lives through art, scrapbooking and writing. 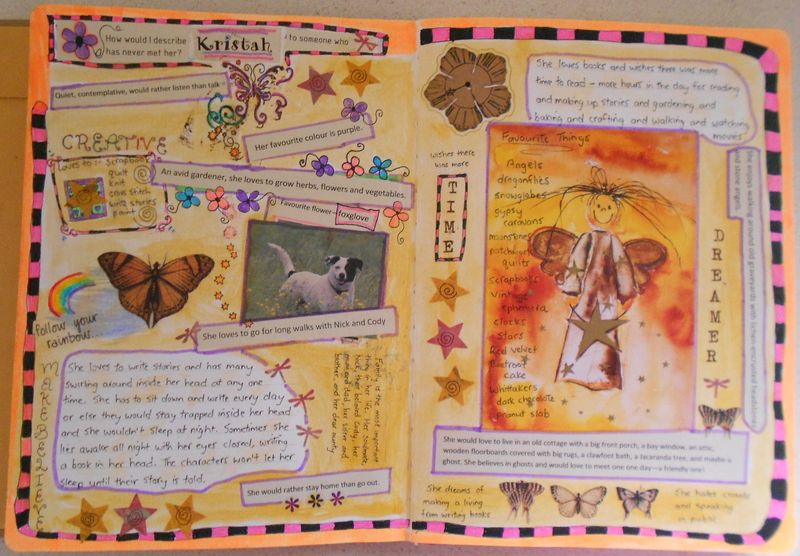 Each week Suzi posts a prompt for you to write about and then create an art journal page. During the week, she posts online what she has done with the prompt, and at the end of each month she creates a painted art journal page on video, showing how she uses different mediums to create her art. Students can share their pages online for the rest of the class to see, but it is not compulsory. 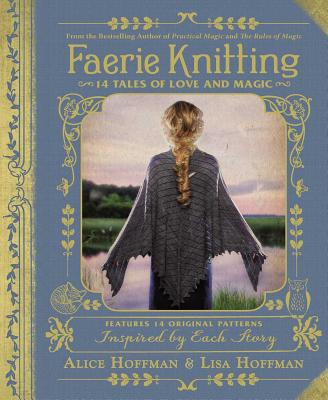 It is very inspirational to see what others have done and how they interpret the prompt. Each person’s art is so unique. The course runs for three months, but you can work at your own pace, as the materials and videos are available to view and download until the end of the year. I am really enjoying the class. Other than my garden journal, I have never done any art journaling before. I find the prompts really get me thinking. Although when I first see the prompt, my mind is a blank and I don’t have a clue what to write, once I start, the words seem to flow, and by the time I have finished writing down my thoughts in a cheap exercise book, I have plenty of ideas for making the art page in my journal. I am using a Rangers Dylusions Journal. It has nice thick card for painting on, a sturdy cover for decorating, and a big pocket inside the front cover for keeping notes and scraps in. How would I describe — to someone who had never met her? The next prompt was all about home. I printed out some pictures of my dream houses and tucked them into a pocket behind the journal card. 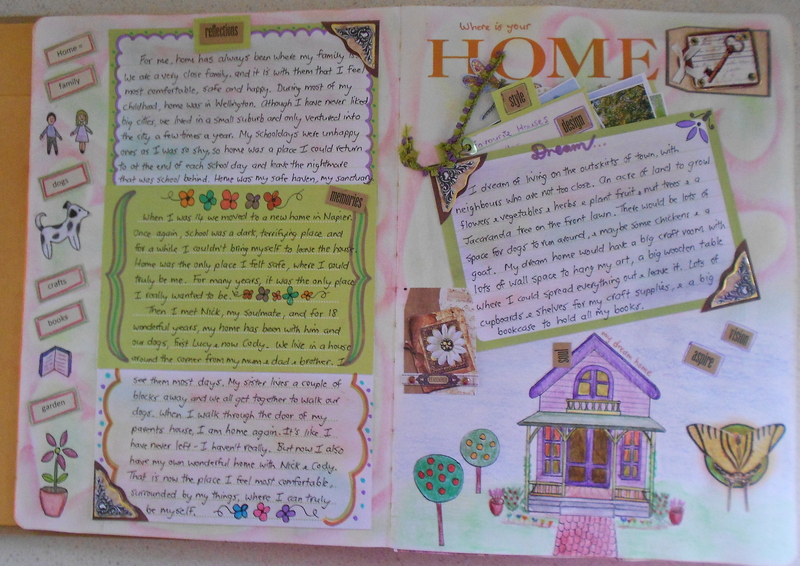 For these pages I used scrapbook paper, coloured pencils, pens, chalks, stamps, and pressed flowers. One of the prompts was to take random photos to document a week in our life, then choose one that represented our life right now, to create an art journal page. 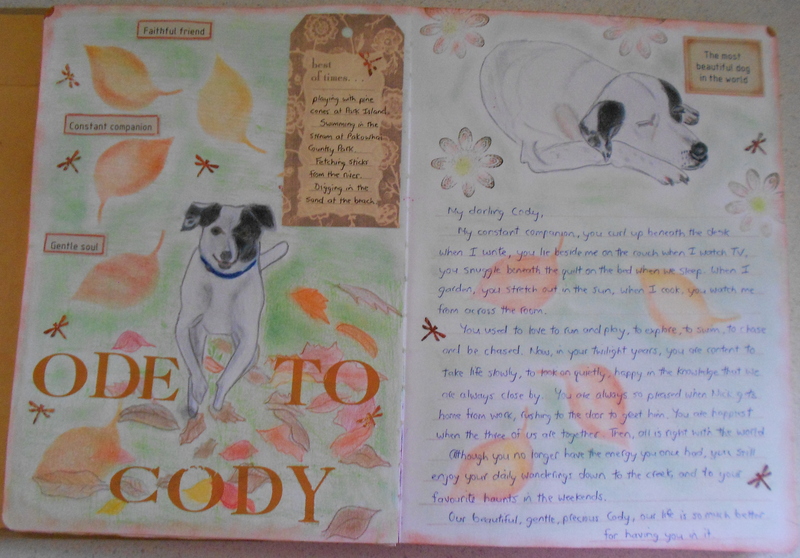 The one constant in my photos was Cody, who is beside me in everything I do, so I decided to create a page around her. I think I’ll leave decorating the cover of the journal until later, as I’m sure I’ll be learning more techniques and gaining more inspiration as the course progresses. 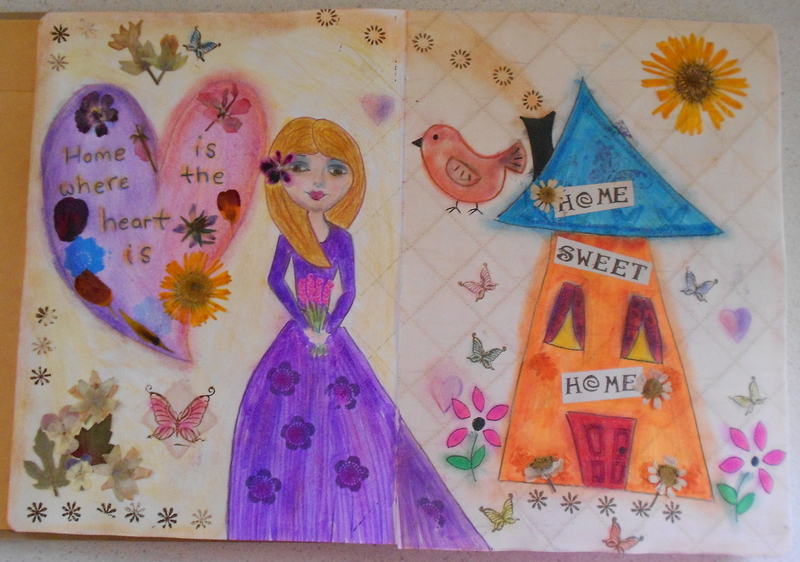 This entry was posted in My Blog, Mixed-media art, Art journal and tagged Suzi Blu, art journal, Tell Your Story. Bookmark the permalink.